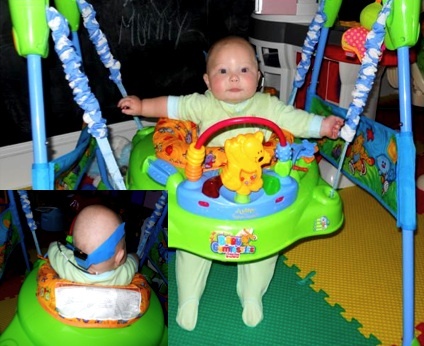 When Kieran Lloyd was seven months old, his favorite way to pass the time, right after eating and sleeping, was bouncing in his Fisher-Price Jumparoo. He would bounce eagerly, smiling and laughing, several times a day if he was given the chance, apparently delighted with the upright posture and the kinetic results of his own kicks. Then his father, head-injury researcher John Lloyd, PhD, realized that before him danced a chance to measure and record an important new data point in the accumulated knowledge about infant head-injury: A magnitude of repetitive angular acceleration that’s known to be safe. He fitted his son with an accelerometer, like those used on crash-test dummies in the lab, and collected data while the boy played. By the time Lloyd was done, he had not only replicated the original 1987 research that first cast scientific doubt on infant shaking as a source of subdural hematoma but also refuted the hypothesis that repetition can make a benign acceleration injurious. Lloyd’s paper joins a series of biomechanical studies that have all reached the same conclusion: Shaking is unlikely to be the source of subdural hematoma in children with no signs of impact or neck injury, despite decades of courtroom testimony to the contrary. Although the theory of shaken baby syndrome has enjoyed thirty years of general acceptance within the community of child-abuse experts, the diagnosis has been controversial from the beginning. Testing it of course was impossible. In the mid-1980s, Dr. Ann-Christine Duhaime and her colleagues set out to investigate whether shaking without impact could cause the intracranial bleeding and swelling that defines the syndrome. They examined medical records and revisited autopsy slides, and they conducted laboratory experiments in which adult volunteers shook infant models wired with accelerometers. They found that shaking without impact did not reach the presumed thresholds for the intracranial bleeding or neuronal damage that’s presumed to result from shaking. 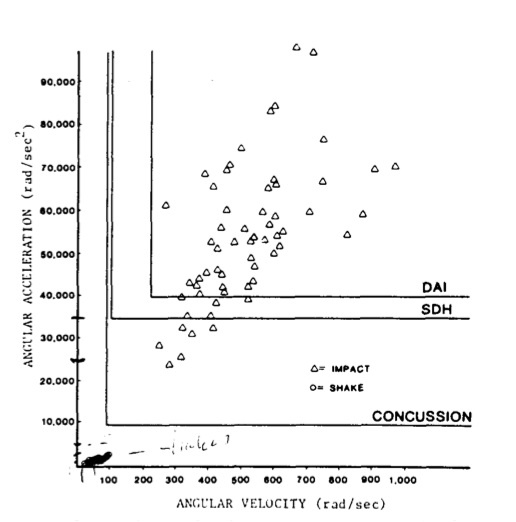 Then the researchers asked their volunteers to throw the dummy down after shaking it, and learned that accelerations upon impact reached injury levels, as illustrated in Figure 2 from their paper (“The Shaken Baby Syndrome: A clinical, pathological, and biomechanical study,” Journal of Neurosurgery 66:409-415, 1987). The shaking data are the cluster of points at the lower-left corner; the triangles are impact trials. DAI stands for diffuse axonal injury; SDH stands for subdural hematoma. Lloyd did not conduct impact trials, but his shaking data were in the same range as not only Duhaime’s data but also those of Prange et al., who replicated the original work in 2003 (“Anthromomorphic simulations of falls, shakes, and inflicted impacts in infants,” J Neurosurgery 99:143–150, 2003). To help establish a base line for the forces commonly experienced by an infant, Lloyd also recorded acceleration data during what are called “activities of everyday living,” or ADLs. Adult volunteers rocked and burped the wired crash-test dummy, walked and ran on a treadmill with it, and took it for stroller rides over various surfaces. Lloyd also had volunteers shake the demonstration doll sold by the National Center on Shaken Baby Syndrome. The doll is commonly used in trainings, and occasionally it’s allowed in court. The doll weighs only two pounds and volunteers were able to shake it longer and harder than the CRABI-12, producing higher angular accelerations—but still not high enough to reach projected injury thresholds. 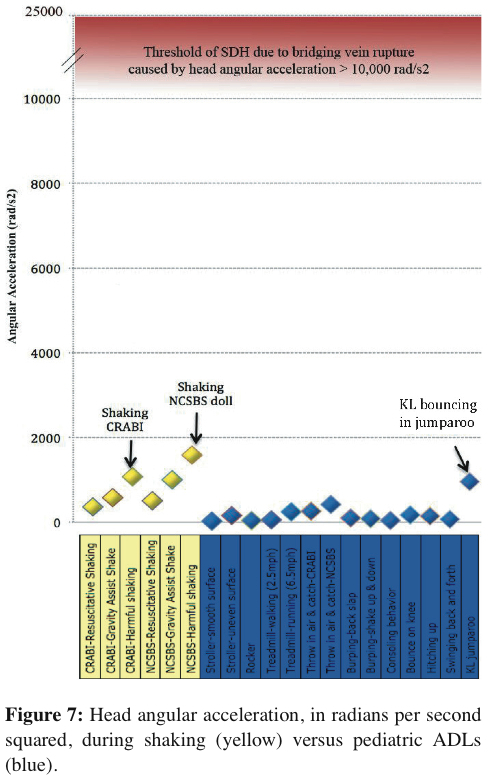 Figure 7, below, from Lloyd’s paper summarizes the accelerations recorded during various scenarios. The entire article is available on line at this address. Falsely accused of shaking our son, too. The USA needs to follow the British and Canadian example, and review all its cases.